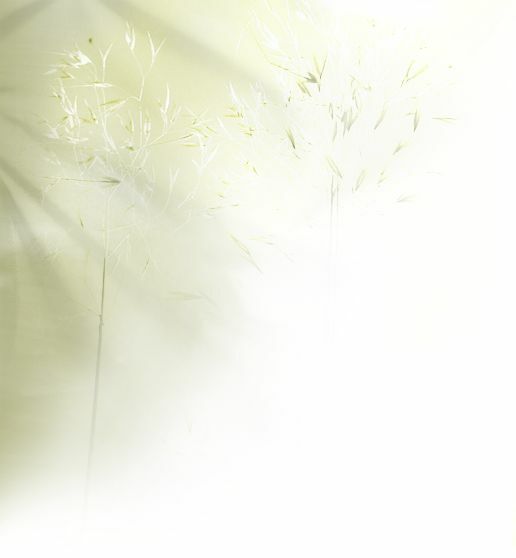 Before 2005 ends I want to send you five more photo''s, to do with as you see fit. 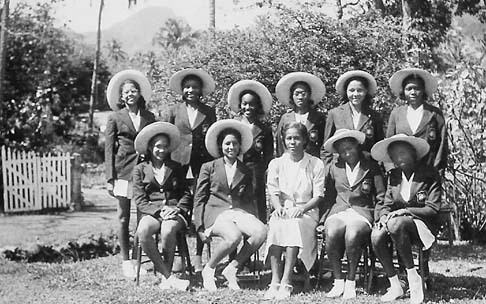 The ten girls in large hats to be seen in the first picture are sixth form pupils of the GHS in 1949. I do not know any of them, but I do know the teacher in their midst. She is Miss Millicent Byron. 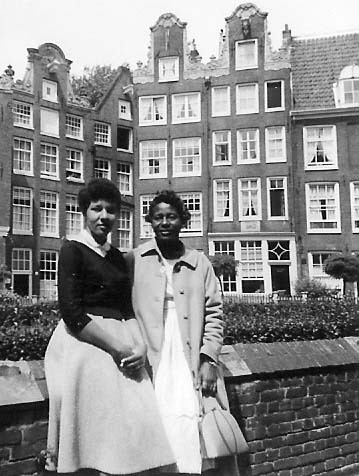 Ten years later, in 1959, she visited Noel Lopey and me in The Hague, a few months after Noel had come to the Netherlands and a few months before we were married. The second picture shows Miss Byron and Noel in the Begijnhof, a beautiful close in the centre of Amsterdam. Unless my memory deceives me it was only a year or a few years later that Miss Byron was drowned, I believe while sailing off St.Kitts when the Ferry Boat Christina sank. The third picture was taken in December 1949 at Kingstown Port, on the occasion of GHS teacher Miss Ellison leaving St.Vincent. This time Noel is among the pupils depicted (third from left). 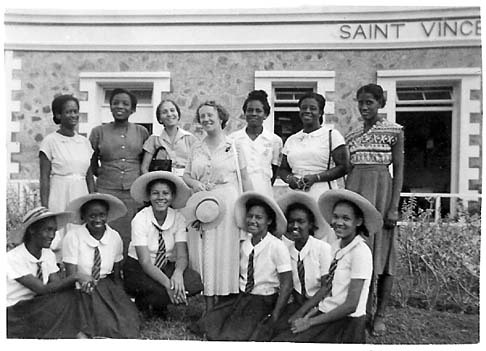 Lynda Snelling, to whom I once showed this and other pictures, recognized among the teachers her mother, Ruby Windebank, and Miss Hiddle, and among the pupils Pauline Allen, Jenny Jacobs, Sidney Morris, and Lorna Findlay. The fourth picture shows Noel with sir Rupert and lady Hepzibah John in January 1974. (I can only hope that I spelled the name Hepzibah correctly.) During this, my only visit to St.Vincent we were invited by Sir Rupert, the then governor, to have tea in Government House. This was most pleasant, and I also fondly remember the walk up to Government House through the beautiful Botanical Gardens. I hope you like these pictures, and also that 2006 will be a good year for you. From Tony: The 5th picture will be loaded in Feb 2006. Having visited Holland, there is usually a pulley at the external top of the building that allowed you lift heavy items (e.g. pianos) and bring them in through the window..
Botanical gardens in the background. Greetings from Trinidad & Tobago and best wishes to you and your family for a blessed 2006. 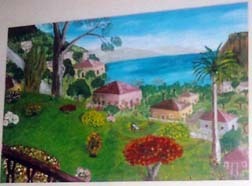 I have just had a chance to visit you website and noted some pictures sent to you by Noel Lopey's widower. respect: Miss Hiddle is not in it. I met Mrs. Windebank only 20 years later, in 1969, when she was living with Lynda & George in Crawley (England); the picture I then took shows her to be an old lady, and I believe she was already suffering from reumatism. I have been trying to remember whether I met all three of the girls who were with Noel on the SS Hildebrand, but though all of their names are familiar to me I am not sure. I only met Noel after she had finished her nursing training in Epsom. She then went to Glasgow for midwivery training, where she introduced me to several of her friends, including I think June, but I am not sure about Vilna and Clare. One question which I also asked Lynda but she could not answer: do you happen to know the present whereabouts of Stella Nanton? Her I met several times, most recently in 1993 when both of us happened to be in Toronto on the same day, and we had a very pleasant lunch in the revolving restaurant on the Space Tower. She was then called Stella Rosenzweig and lived in New York, but I believe she has since moved to Florida without giving me her new addres. In the photo at the top of the page, the Student standing directly behind Millicent Byron is my great aunt, Elaine Duncan who lives at Dorsetshire Hill. 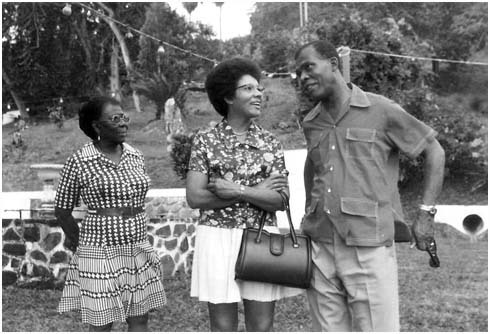 The person on her right maybe Therese Cuffy.